MYITKYINA, Kachin State—Hundreds of Kachin leaders met this week in the state capital of Myitkyina with the UN special advisor on Burma, who was allowed to attend peace negotiations between Kachin rebels and the Burmese government for the first time on Tuesday. The leaders on Wednesday warmly welcomed UN envoy Vijay Nambiar and thanked him for participating in the negotiations the day before, which marked the first time the Kachin Independence Organization (KIO) had agreed to attend peace talks in the government-controlled region of Myitkyina. The previous two rounds of negotiations this year were held in neighboring China. 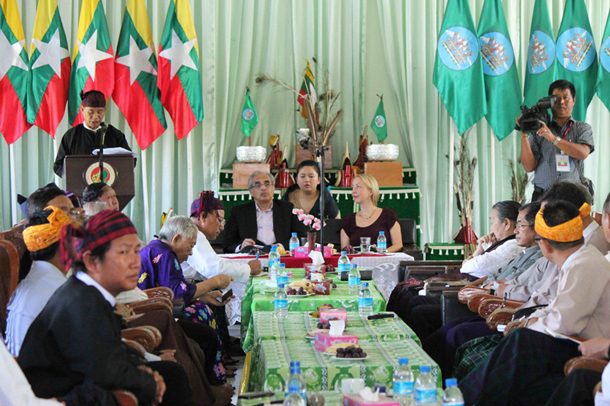 The UN’s Nambiar said the discussion with Kachin leaders was productive. “There were frustrations, as well as expectations and hopes, which have been expressed,” he told reporters. The KIO, the political wing of the Kachin Independence Army (KIA), signed a ceasefire agreement with the former Burmese military regime in 1994, but the agreement broke down in June 2011 when fighting erupted between the government army and KIA soldiers. The KIA is the nation’s second-largest armed ethnic rebel group, with an estimated 10,000 fighters. Also on Wednesday, KIA leaders discussed military affairs with a commander from the government army, although no details of were revealed. Both sides said they were satisfied with the meeting. Gen Gum Maw and Gen Zaw Taung represented the KIA, while Lt-Gen Myint Soe represented the government army. Myint Soe said the group discussed troop deployments as well as the ongoing clashes between the government army and other ethnic armed groups which have already signed ceasefires. “We come here because we need to discuss political matters,” said Gen Sumlut Gun Maw, the KIA’s deputy chief of staff. They said they expected to conclude the talks on Thursday.